This coming Monday, (Sept 11), TWO Wellness Warrior online bootcamps are starting: Sign up now and be part of our Wellness Warriors Community. Back by popular demand, Dr. Jamie will run another round of Nutrition Bootcamp! Click here for the description of 7 Week Online Nutrition Bootcamp. Karrie participated in the January Wellness Warriors Group. During the 6 weeks of the food changes, she lost a whopping 20 pounds. She has stuck with most of her changes, with a few reintroductions, and is officially down 34 pounds since the program began! The picture shown here on the left was taken December 23, and on the Right was taken on February 21. What a difference! Here is what she had to say! How are you feeling after participating in Nutrition Bootcamp? "Where do I begin? My hair, skin and nails are amazing! I wake up feeling well rested and ready to start my day! Whereas before I felt exhausted all the time and used copious amounts of coffee as a crutch. Now, I have maybe one cup a day. I have less brain fog and feel more focused on things. Also, I don't feel bloated or weighed down and sleepy after I eat. Furthermore, I don't crave sweets after meals and my taste buds have changed. Over the course of 7 weeks, I have tried so many new foods and have found a love for cooking again. I could go on and on! I will leave you with the fact that I feel so good and so energized that I started going back to the gym again." I went to see my internist in August of 2016. I was gaining weight (183#, 5' 8 1/2”), fatigued and constipated for quite a while. She did a full work-up with an array of labs, and referred me to a GI specialist for a colonoscopy. Everything came back normal! I have arthritis in my spine and feet that causes me discomfort and pain at times. I had a total knee replacement 2 years ago, which I continue to have mild swelling and joint stiffness. GI doctor: Take Miralax for the rest of your life. He said that there is nothing wrong with that. Ortho: We can give you cortisone injections for pain. Taking this program has been the most important thing I have ever done for MYSELF! This new way of eating real and whole foods is amazing. By subscribing to the Online Wellness Warriors, I felt that I wasn't on my own. How do you feel now, compared to when you started this program 7 weeks ago? I have lost weight so my clothes fit me better. I was 175# when I started seven weeks ago and this morning I am 161#!! 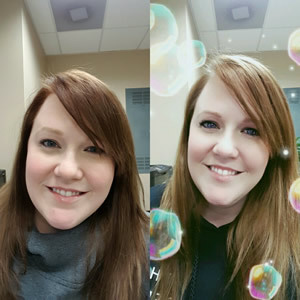 !I have lost 14 pounds! The arthritis, in my feet and spine, doesn't bother me, as it used to. My knee joint doesn't feel stiff anymore. I have seasonal allergies and I haven't needed to take any medication this spring. How did you feel about the educational content presented during this program? Excellent! I see food so differently now and how it affects every part of my body! The daily education via email was so beneficial. The information was so eye-opening! Having that daily communication, really helped to keep me on track and was such a great support (I enjoyed the Dr. Jamie and Joelle video clips). What long term changes will you make as a result of what you learned during these 7 weeks? Eating well is part of me now, and I WILL NOT GO BACK!!! I will continue to be gluten free. Though I do eat Ezekiel sprouted bread, toasted, once in a while, just one slice. I have noticed no problem with it. I will remain dairy free, at least for now. I would like to try Wallaby, whole milk plain yogurt again in my smoothies, sometime for the probiotics. I don't crave sugar like I use to. This has been an amazing journey, and it has changed my life! I have learned so much about the foods that I put into my body, the good and the bad and how my body works well when I eat real whole foods and how my body declines with poor food choices that I may make (and I did make some). I feel so much better when I'm eating real whole foods! This is not a diet but a lifestyle of eating well. It was a big help having the green, yellow and red food lists and many recipes to try. I never felt as though I was doing this on my own. I was always encouraged to succeed, and to keep going even when I made some poor choices along the way. Dr. Jamie was always there to answer my many, many questions. I will be continuing on this journey for the rest of my life! Thank You, Dr. Jamie and Joelle! Jared is my husband. 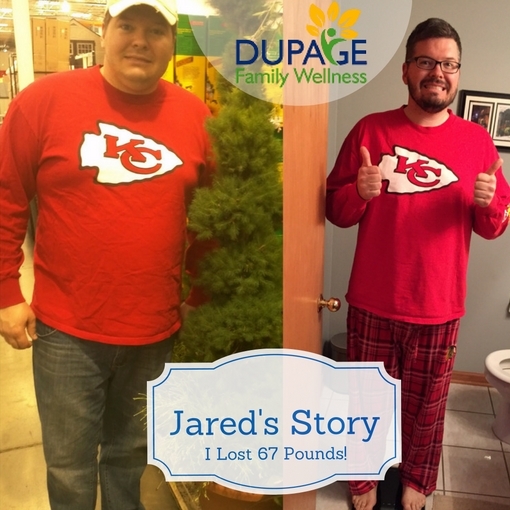 I am SO proud of him, and SO excited that he's improved his health by losing 67 pounds! After several years of "gentle convincing," Jared finally decided that he wanted to lose weight, and he agreed to follow my advice about what he should eat. I am going to let him tell his own story, so keep reading. As I helped Jared make these changes, I realized that there are SO MANY people that want to FEEL BETTER and LOOK BETTER. There was no way I could stop with Jared. I decided to create an online wellness program to guide people like you to improve your weight and health too! I know it sounds too good to be true. I don’t know if I’d be able to believe it if it wasn’t what I actually did. No, I didn’t have lap band surgery or anything close to that. Get this, I changed the way I ate, and that’s about it! What Motivated Me to Make Changes? The story starts with a new health insurance company. They were charging us an extra 80 dollars a month as long as my weight was over 211 pounds. My wife (Dr. Jamie) had been trying to get me to change my diet for years, but this finally motivated me to listen to her and try to lose some weight. I can think of lots of things I would rather do with 80 dollars each month than give it to an insurance company. From what I have learned, the Standard American Diet, promoted by the big food industry and its marketers. is not doing Americans any favors. I encourage everyone to take Dr. Jamie's 7 Week online bootcamp. It will change your life. Once you learn, you too will become a Wellness Warrior, eager to help your friends, families, and community become healthier with you. Together we can build healthier communities. Learn more about the Bootcamp. p.s. I got all the emails for the last 7 week nutrition bootcamp. I was impressed with the amount of information and how it was presented in an easy to understand way. The format, an email every day, helps you stay on board, and absorb the ideas without getting overwhelmed with everything at once. Dr. Jamie's enthusiasm and energy is impressive and inspiring. I am so excited about my results, both weight loss and improved health, that I want to share it with you. I have lost weight without feeling like I'm on a diet. If you had told me on January 1, that before summer was over I'd lose 25 pounds, I would not have believed you. I now know, it is possible. If I did it, you can too.